Shiatsu is a holistic therapy that originates from Japan, and is influenced by Chinese and Western knowledge. It is based on similar principles to acupuncture, but using the pressure of the hand rather than needles. 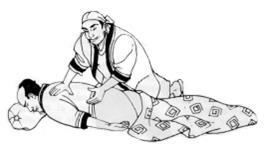 Shiatsu acts to rebalance the body's energy channels of vital energy, to promote your well being, support good health and prevent illness. In 1955, Shiatsu was officially recognized as a therapy by the Japanese Government. In Europe, Shiatsu is becoming more widespread especially in the United Kingdom, Germany, Switzerland and the Scandinavian countries. Shiatsu is one of the 8 alternative approaches identified in the resolution A4-0075/97 of the European Parliament voted on May 29, 1997, as "quite interesting non-conventional medicine".